Becoming a parent for the first time is an incredible life change and it is easy to feel overwhelmed. Not only are you now responsible for a another human being, but you suddenly have a list as long as your arm of things to buy. It can be daunting considering all of the essential baby items that you definitely need, things you might need and things you just want. Looking at websites and a million mummy blogs for inspiration can be just too much as there are just so many things. So here at BuggyPramReviews, we have created a list of essential baby items that we couldn’t have done without. The infant carrier, (or sometimes called “baby car seat”) is mandatory. The hospital (if that’s where you choose to have your baby) wont let you leave the hospital with baby without one if you are travelling home by car. We all saw the images of the Duchess Of Cambridge right? There are many to choose from but essentially they all do the same thing. You place baby in the infant carrier, leave the hospital and (using the car seat belt) strap baby (rearward facing) into the car and make your way home. 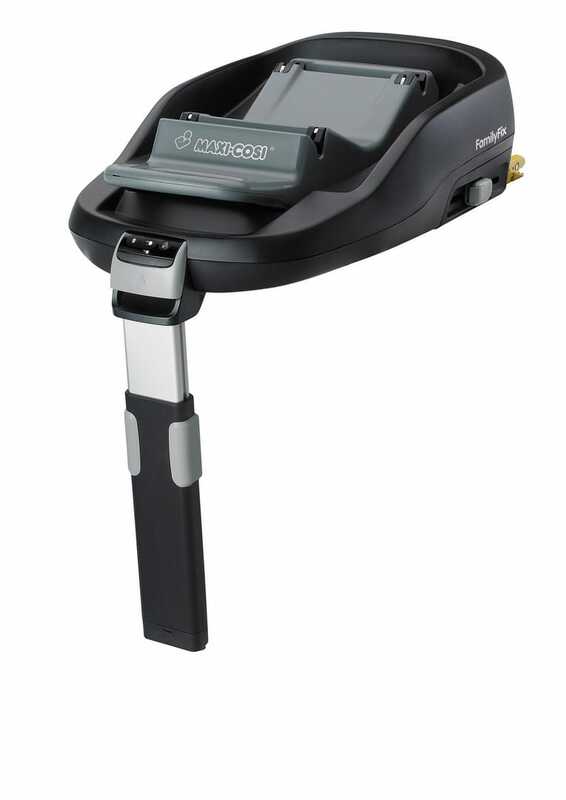 You will have also purchased a car seat base (essential baby item number 2). The Maxi-Cosi Pebble Car Seat is the ideal option for new mums. It is cosmetically appealing, easy to use and makes getting your baby in and out of the car as hassle free as its ever going to be. Comfort is integral to the design of this product with its cosy, padded lining, removable neck pillow and a support wedge. It comes with an integrated sun canopy for protection against the elements that tucks nicely behind a rubber flange. 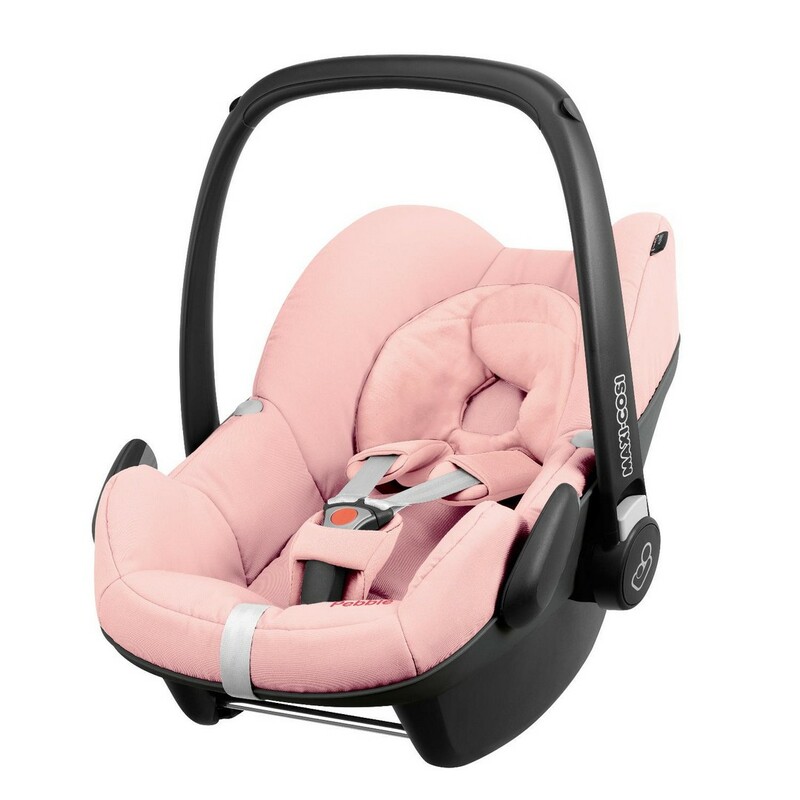 Safety is also a main priority with this car seat, it has a side impact protection system, adjustable headrest and harness, obviously it meets the European safety standard: ECE R44/04. The Maxi-Cosi Pebble Car Seat costs around £165 and is definitely worth the investment as it lasts til your baby is around 1 year old (or 13kg), sometimes longer. The guide is to only stop using when babies head is above the top of the car seat. It’s the safest place for them to be. Why go for the Maxi Cosi Pebble Car Seat? Well, it fits almost any pushchair as most brands have made compatible adaptors for maxi cosi. This combination of pushchair and car seat is called a “travel system“. There are many to choose from depending on your lifestyle. See our Maxi Cosi Pebble Car Seat Review here. 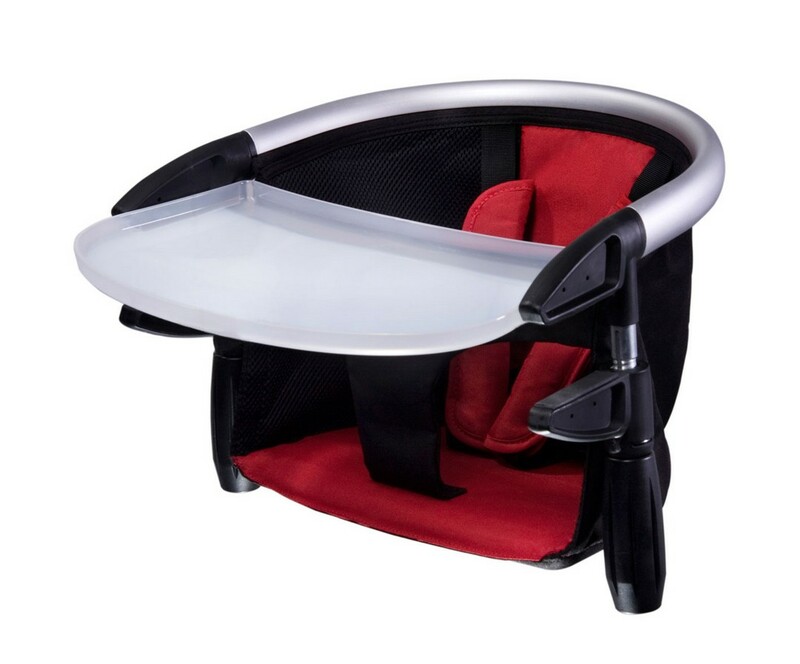 Another item that is essential for your baby’s safety is the Maxi-Cosi FamilyFix Base or base compatible with your car seat brand. This has user friendly installation and ISOFIX attachment points, with light and sound confirmations to advise you of correct installation. It is compatible with the Maxi-Cosi Pebble Car Seat (and Maxi Cosi CabrioFix Car Seat (the pebble’s cheaper brother) mentioned above. 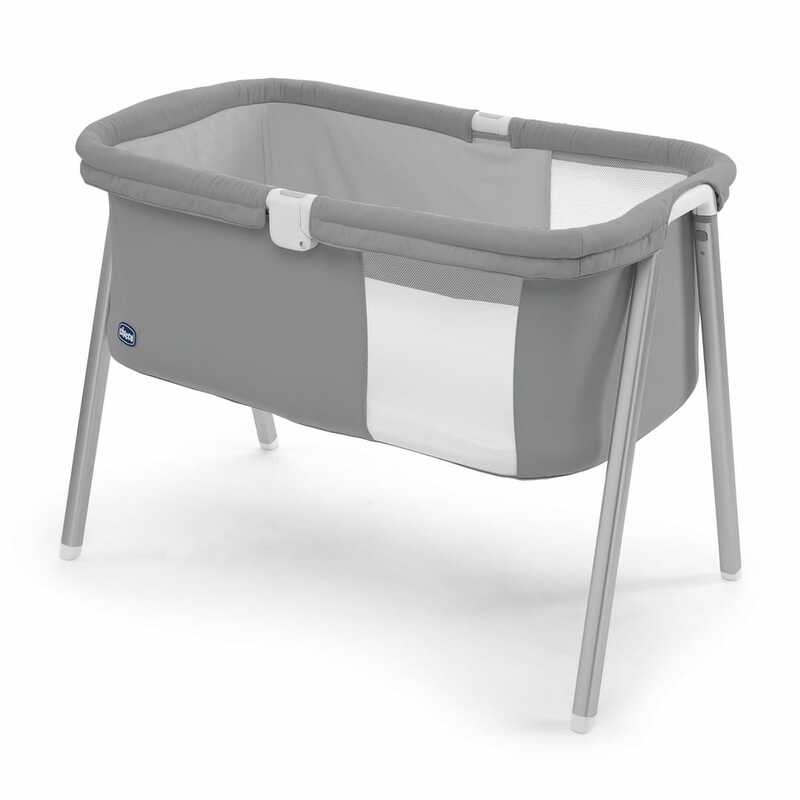 We reviewed the Maxi Cosi FamilyFix Base here. When you first become a parent, leaving your new baby to sleep on his/her own can be a nerve-wracking experience, and it is normal to want to constantly check on your little one throughout the night, are they breathing, is the tog warm enough, are they comfortable, does the nappy need changing. One product that can make this easier is a good baby monitor, we think the AngelCare range is excellent and would pick the new and enhanced AngelCare AC1320 Video & Sound Monitor as our essential item. This features a 3.5” colour screen with adjustable brightness, infra-red night vision to see your baby in the dark, a feature to zoom and pan for close-up viewing, and a temperature control and display to make the room as comfortable as possible. It also has a nightlight and indicates when out of range and battery. This item comes in very handy and lets mum and dad sleep easy knowing they can check on baby at any time without even getting out of bed. Once you are ready to take your baby outside, there are some must-have items that will keep you and your baby content during your walk because you may be hot doing the walking but baby needs to be well wrapped. One item we love is the 7AM Enfant Blanket 212 Evolution, it is more expensive than pushchair branded footmuffs but the quality and longevity of the product makes it absolutely fantastic and we think, an essential baby item. It has the standard five-point harness openings to adapt to your pushchair and car seat. It has an anti-slip back panel so your baby won’t start slipping down whilst travelling. It has zips and toggles in so many places that make its functionality as good as its appealing design. 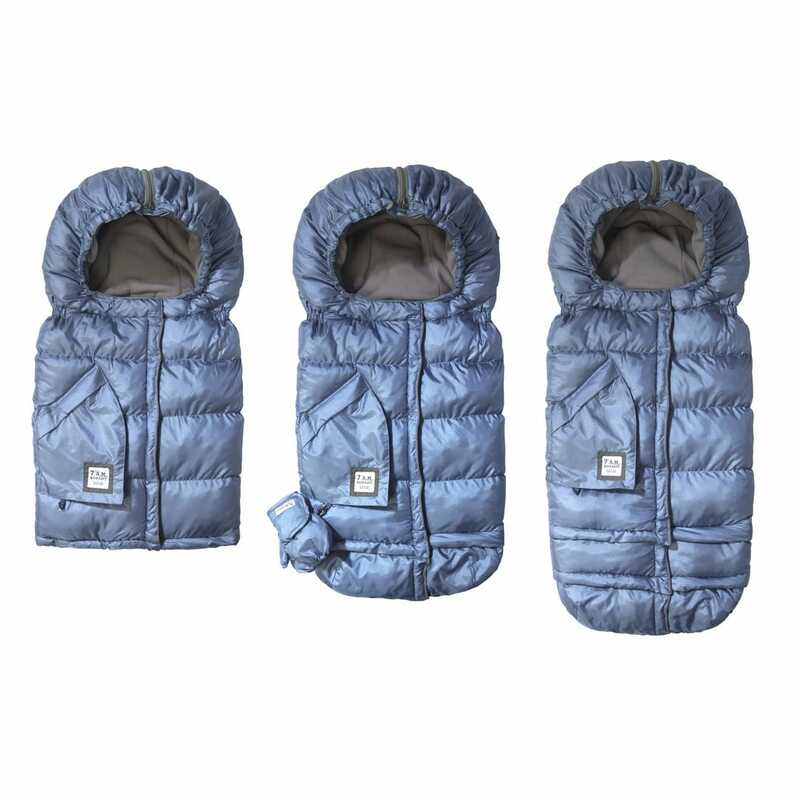 It includes a water repellent outer shell, fleece lining, ergonomic hood and is machine washable. This is the perfect, practical solution for keeping baby toasty warm. We reviewed the Blanket 212 Evolution here. You may initially try to use one of your existing handbags for your baby changing bag but in the end we all have to go for one designed for the purpose. The good ones have a lot of included items, zips, clips and pockets that make the nappy changing procedure while out a whole lot easier. You will need a lot of compartments for all the bits and bobs you have to carry and want to keep separate. There are a lot of changing bags to choose from but we again pick a changing bag from the 7am Enfant line up because, they have done the best job at making the bag look amazing yet be completely designed for purpose. Again, they do cost that little bit more but once in your hands, you are immediately happy you went with it. It’ll last for years. The 7AM Enfant Voyage Bag is our pick of the range. It comes in a variety of colours and can be purchased in large or small. At 17” x 12” x 9”, the large bag is perfect for use as a changing bag to carry essentials for both you and your baby. 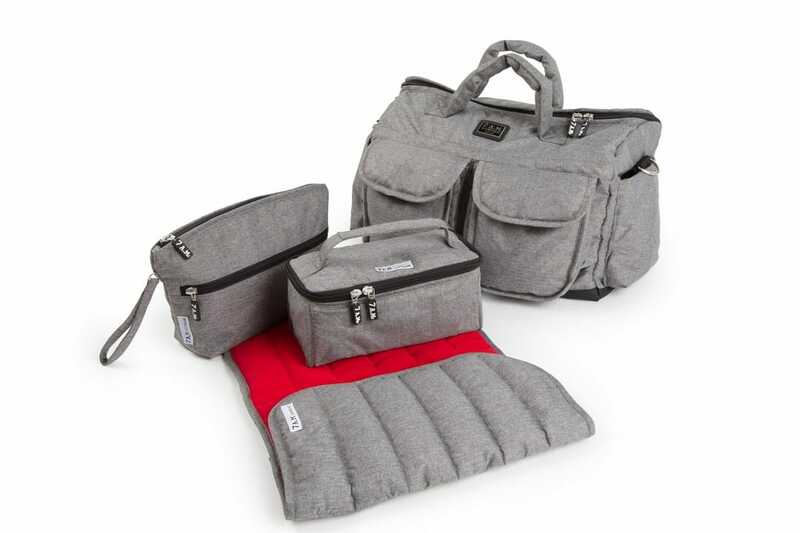 It also comes with a comfy fleece-lined, cushioned changing pad, an insulated lunch box, and a separate zippered pouch which can be used alone as a clutch bag. All items are machine-washable and lightweight so they easily fold down for storage. You’ll find yourself with a good nursery at home that you’ll have put 9 months of preparation time into but you may have overlooked what happens when baby travels to granny, a weekend away, a sleepover, a mid afternoon nap at friends. You need a lightweight, transportable baby travel cot. We like the Chicco Lullago Travel Crib. This is a lightweight, secure crib that folds away into a compact travel bag with easy-to-carry handles. The lining removes with a zipper and is machine washable, the mattress is foldable and the feet are anti-slip ensuring a stable bed for baby. This travel cot is a great item for on-the-go parents and fits easily into any car boot. Gone to the coffee shop to meet your NCT class? They have run out of highchairs? A portable highchair solves so many problems at home and on the go. We love the Phil & Teds Lobster Compact Highchair and travel bag This item is suitable from 6 months and is strong enough to hold a baby up to 37lbs / 17kg. It has clamps that secure it to practically any table, the fabric is removable and the food tray is dishwasher safe. Furthermore, it flat packs and comes with a carry bag making it incredibly easy to transport to Grandparents’ houses. This guide wouldn’t be complete without mentioning a pushchair. What we find is that new parents go for a monster pushchair, all singing, all dancing, they then need a support vehicle when they pop out in the car. By the time they get to baby number 2 or a couple of years down the line they realise that all you really need is a light, city stroller for whipping in and out of the car. 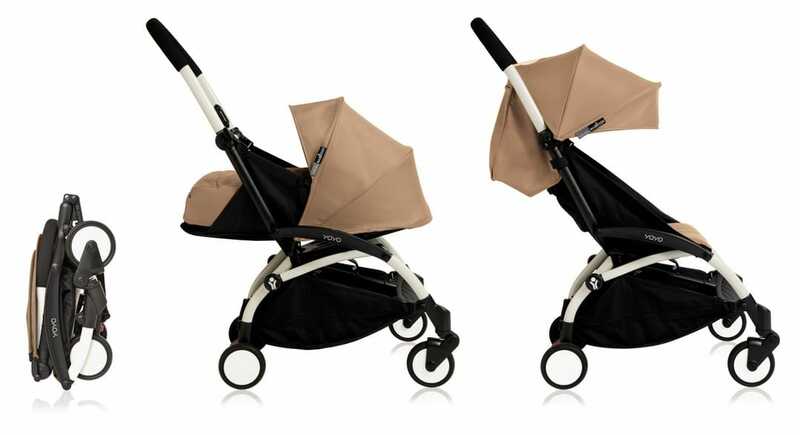 The best of class for that spec is without doubt the Babyzen Yoyo+ Pushchair. The complete pack is the one to go for, it comes with chassis, newborn pack and 6+ pack. This bundle ensures that the pushchair lasts for years and is incredibly convenient with a large storage basket under the seat, a raincover and a carry bag. It even folds up so small that it will fit in the overhead compartment of an aeroplane (certified) as otherwise you will have to walk the 2000 miles from to baggage reclaim. This really is an essential baby item even if you get this one or similar as your 2nd pushchair (dont worry, you’re not being greedy, the average is 2.4 pushchairs per household). The Babyzen Yoyo+ can also be turned into a travel system with the car seat we mentioned earlier the Maxi-Cosi Pebble Car Seat, you just need a set of BabyZen YoYo+ Car Seat Adaptors. Our caveat to this solution is if you are a jogger or avid dog walker, then you will need something more substantial. The Mountain Buggy Terrain Pushchair would be our pick for the jogging parent and the Out n About Nipper v4 Pushchair for the avid dog walker. With more meals to cook over the next few years that you’ve had hot dinners (excuse the pun). You do need a highchair but you might as well pick a fun yet practical highchair. 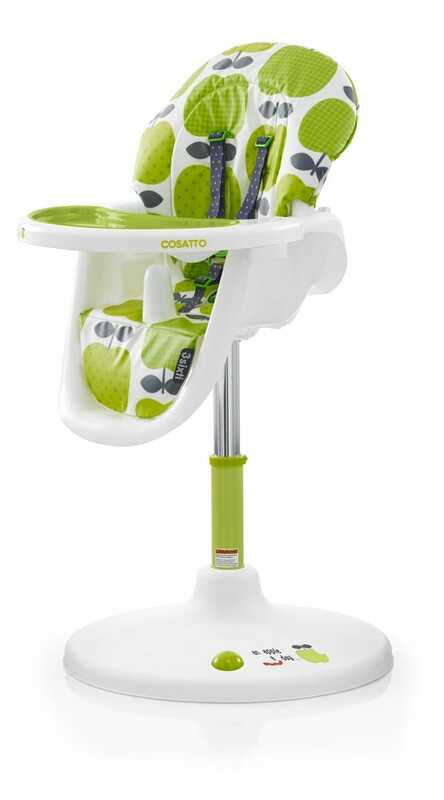 We love the cool and funky Cosatto 3 Sixti Highchair, which comes in a variety of prints that Cosatto are well known for. This chair is suitable from 6 months and swivels 360 degrees, making it easy to turn around so your baby can see you. The tray can be removed so your baby can eat at the table with the family and the seat itself reclines into 3 different positions. We reviewed the 3 Sixti here. Once baby is mobile you basically need a 20 minute revolving entertainment centre and because it’s a new experience, babies love to be upright and a good baby walker is just the job. 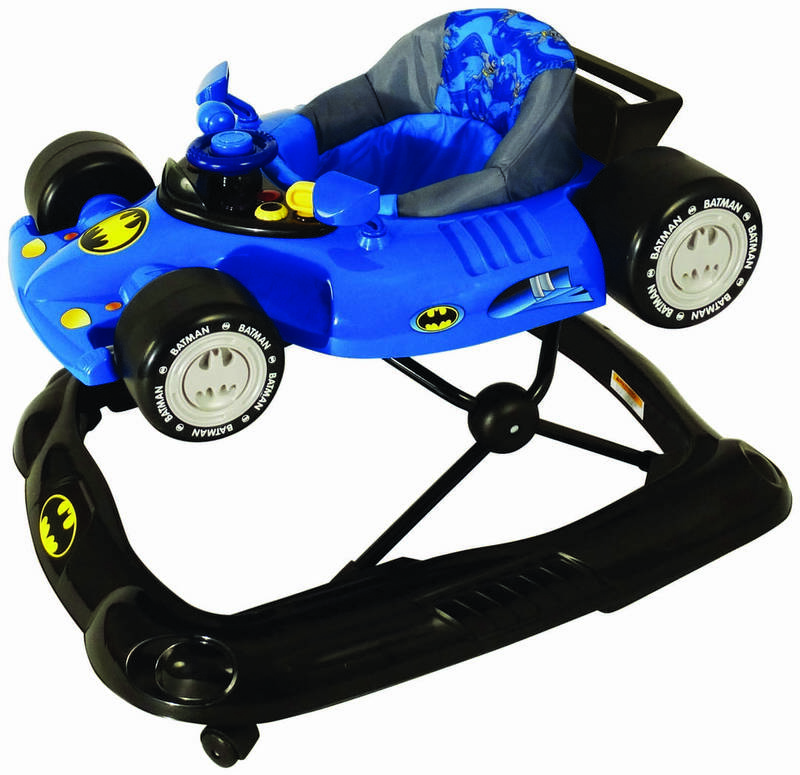 We love the sit-in walkers and particularly like the fun design of the Kids Embrace Batman Baby Walker for the boys and the MyChild Car Walker for the girls. They have a comfy seat, an interactive tray with lights and sounds, and folds down compactly for easy storage. This will keep your little one amused (at least for a little while) in a contained, safe environment. Having twins!? We haven’t forgotten, there is only 1 twin pushchair worth its salt for this job. 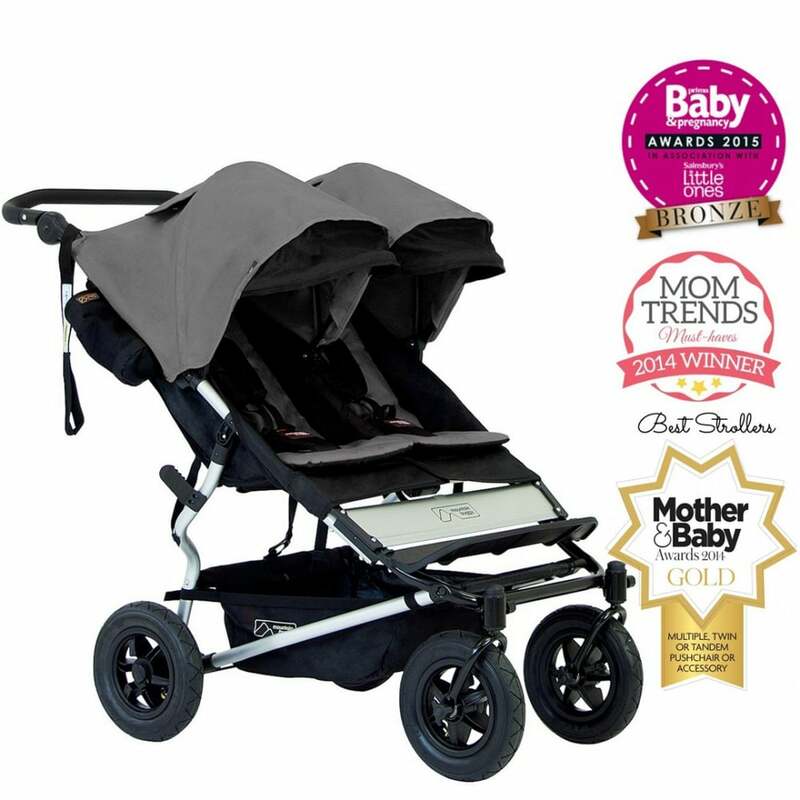 The Mountain Buggy Duet Pushchair its perfect in every way.